The Dedication to Racing finalists Joe Agresta and Steve Adams have done the pre-dawn racing round for a total of around 50 years, and don’t look like stopping any time soon. After a short career as an apprentice jockey, Joe Agresta joined the late Bart Cummings and for some 30 years was his main Melbourne exercise rider, a job that meant he sat on more Melbourne Cup winners than any jockey alive. Now a foreman for the Leon and Troy Corstens training partnership, 66-year-old Joe is also a forceful advocate for stable staff and track riders. “When the TBA, Racing Australia and Godolphin proposed these awards I was so happy because I’ve been lobbying for trackwork riders and stablehands to get a better deal for a long time,” he said. 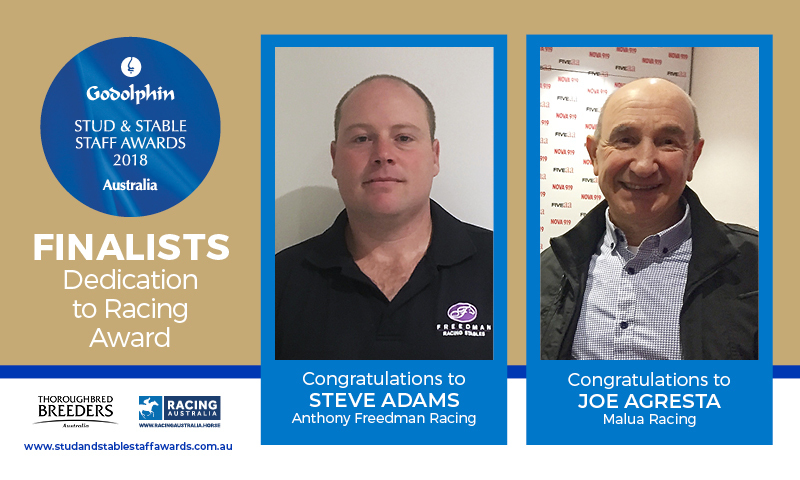 Steve Adams has worked for the Freedman family for the past 15 years and, along with his present boss and nominator Anthony Freedman, has proved one of the constants in the stable’s long-running success. Steve runs the trainer’s Flemington stables, imparting his experience and knowledge to the latest generation of the organisation’s staff. Anthony Freedman, who nominated Steve for the GSSSA, said his foreman was instrumental in the careers of the stable’s horses and its staff. Anthony Freedman, who nominated Steve for the GSSSA, said his foreman was instrumental in the careers of the stable’s horses and its staff. “Steve’s horsemanship, dedication and patience is renowned, both with horses and with his fellow workers,” Anthony said. Steve is grateful for the recognition, at the same time displaying the modesty common to all finalists.